My friend Kyle, aka hlywdkjk-better known here as Kyle in Hollywood, has passed away. Kyle and I met on these message boards over eight years ago and we’ve been friends ever since. In July 2006, we met in person, along with filmlover, appropriately enough, at the bar at Musso and Frank’s (in tribute to Ben M and Tom Brown, I suppose). A non-musical trio was born. He was helpful to posters looking for images and for information not only about films but about TCM as well. When he was picked as one of the Fan Programmers for the 15^th^ Anniversary of the channel, he chose Meet John Doe. I was there the morning of the taping and watched as he and Robert Osborne continued talking for quite some time after the cameras stopped rolling. Kyle loved talking about film. He was proud to be an advocate for TCM and to help carry their message forward. If it weren’t for these message boards our paths would have never crossed. I will always be grateful they did. I will miss him with all my heart. He is, and always will be, my friend. For my part, I didn't know him well, but Kyle was always polite and helpful. We had our disagreements, but I had enormous respect for the man. My condolences to his family and friends. I didn't know him well, but we did PM each other a few times. He was encouraging at a time that I needed it and didn't know it was so apparent. RIP, Kyle - and thanks for the kind words. Thank you, Michael and Lynn. I think I am in shock. You just sort of expect to keep seeing posts from everyone each day. Then when this happens, it is sad and numbing. I was so sad when I learned about this. He was such an inelligent poster and he was always very polite and had a lot of interesting information to share. I've been talking with him on the board for years but I never knew he was sick. He never said anything about it. I knew him only through this forum but I feel as if I have lost a close friend. His knowledge of movies was phenomenal and his entries in the TCM Programmers Challenge were all among the best. He was a man of noble nature and his kindnesses extended in many directions. I am stunned and saddened to hear the news of Kyle's passing. What a wealth of information he was about classic films. His threads here were very very popular, and he was a fair-minded gentleman. I've seen him at TCM's film festivals. I remember, as one of the lucky fifteen guest programmers for TCM's 15th anniversary, sitting in the hotel bar with him, lzcutter and my guest, talking about films. My friend, whose not as knowledgeable about classic films, was trying to keep up and frankly...so was I with that dynamic duo of Kyle and Lynn. My condolences to Kyle's family...and to you Madame Cutter, as I know he was very dear to you. He must be at peace now. Thank you so much for putting together this memorial thread for Kyle. He contributed so much to this website with his wealth of knowledge, the photographs and memorabilia he shared with us, and, as several of you have noted, his kind and friendly voice. It is difficult to realize that he will not be posting here again. I was fortunate enough to meet Kyle at the first TCM Film Festival, and I liked him immediately. The personality you have gleaned from his posts is just how he was in real life. Chatting with him in Club TCM at the end of the evening was the perfect way to wind down after a very full day. The last couple of years at the festival, the rain and the humidity bothered his lungs, and none of us got to see as much of him as we would have liked. I'm grateful to his family for contacting TCM and letting us know. I hope they will take comfort from all the feelings expressed here. His wit, knowledge, charm, and style will be missed. The world is a little smaller and sadder today. I am so sorry to have heard of Kyle's passing, and I, too, was lucky enough to have met him and to have visited with him at all of the festivals. His expertise and vast knowledge about classic film, classic film stars, vintage movie posters, Classic Hollywood, the TCM Programming Challenges, research, references and human nature in general make me weep for both his suffering and our loss at not having him be a part of the Message Board family henceforth. Another library, and a wealth of ideas and creativity has left us. Condolences to his family, and all his Message Board friends. Kyle was the voice of reason on these boards, when many of us (including me) would be getting unreasonable. I learned one important lesson from him very early on; to step back if an unpleasant exchange was developing, and just cool it. And trust me, I had a few of those in my early years. No more. Thanks, Kyle. Just a suggestion – is it possible to archive some or all of Kyle’s threads (like his movie posters, for instance) so they never disappear? I’m sure future board members would really benefit from those threads. Like everyone else, I'm shocked and saddened by this news. I've known him almost the entire time I've been here. Although I never got a chance to meet him, I felt like he was a close friend and he was supportive of me on the board and behind the scenes. He'd been on my mind a lot lately because I noticed his absence. I'm glad to have known him, even if it was in cyberspace. RIP sweet man. You'll be missed. always fair minded and addressed any debate with clear and cutting logic. When I learned from lzcutter yesterday about Kyle passing, I was completely devastated. Kyle and I have been friends for about 7 or 8 years, and with lzcutter joining us I felt we were the Three Musketeers. I have also joked that I thought of us as being from the movie, "1776", with me as John Adams (quick to action), lzcutter (wise and diplomatic and for awhile carried a cane like Franklin), and Kyle was Thomas Jefferson, quiet and reserved, never one to start a fight. My memories of Kyle are many, and I truly regret there will not be new ones. He had a quick laugh, and a knowing grin. If you were going to cast him in a movie, it would probably be as Lincoln. If someone were to play Kyle, it would be someone with a cross of Raymond Massey and Henry Fonda in him (oddly enough, two actors who did play Lincoln). lzcutter and Kyle were very close friends. It's hard to imagine one without the other at the TCM Film Festival. Much of what Kyle has contributed to TCM in one way or another never got mentioned but he never sought recognizition. In all the years I knew Kyle, he never once asked for recognition about anything. 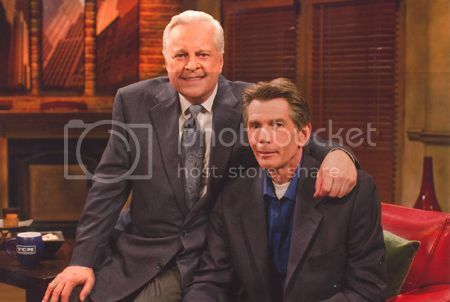 But I am very thankful he got to have the incredible pleasure of being one of the 15th anniversary fan programmers and getting to discuss on TCM one of his favorite movies of all time, "Meet John Doe," with Robert Osborne. In that time of Kyle, lzcutter, and me when we were in Atlanta to film our intros with Mr. O, we became members of a second family...everyone who worked at TCM there. And they have remained close to us ever since. When they have held the TCM Film Festival out here in Hollywood, I think the person the TCM staff was happiest to see was Kyle. People loved Kyle and everyone misses him. I am grateful for the time we knew him. Kyle, along with Lynn, Mongo, Filmlover and a few other early members of this forum were among the first and kindest people who ever made me feel that loving classic movies passionately was a virtue and one that should be shared as much as possible. Kyle's joy in sharing his knowledge and appreciation for film, his quirky but very real and subtle humor, his even temperament, and his encouragement over the years taught me far more than esoteric facts about movies. His example taught me that it was possible to share one's best self with others in this virtual world by remembering that every person one encounters here is flesh and blood, soul and spirit. I suspect that his soul was greater than I ever knew. My heart goes out to his family and friends. R.I.P., my dear friend. I never met you in person but your passing leaves me sad but hopeful that you are at peace. When I joined the board in 2005 with some fear, Kyle was one of the first to greet me. Through those ealy years he was a source of encouragement and a guide through this online world. He helped me with the Programming Challenges and was as happy for me as I was when I won one of them. He would check in with me and now and then put up a Laurel and Hardy movie poster. I always found him sincere, knowledgeable, helpful, and he defended his positions with eloquence. A most interesting man is lost to us now but we'll still be able to look at the posters and read what he had to say. At least we have that much. Thank you Kyle. Rest well. Our friend Kyle with Robert O. Today would have been my brother's 57th birthday and I've been too preoccupied with memories to check the Board until now. Now I'm doubly mourning. Kyle, Lynn and Sue were the first folks I met at the 2011 festival at the Roosevelt Lobby Bar. I got hugs from the girls and a drink from Kyle. Like the rest of you I always admired his knowledge and cool head. He was always ready to advise us tourists on the wheres and whats of Hollywood. The inside matched the outside which was definately easy on the eyes. The photo that was posted as I was writing this proves that; thank you, Lynn, for giving us that to remember him by. I did not realize he had health issues;either he didn't let them show or I was so thrilled to be there I didn't catch the obvious. Of course anything I'm feeling can't compare to what his family and those of you who really knew him are experiencing. I don't think he'd want us to grieve but remember him with happy memories. He loved and was loved; you can't beat that. What a wonderful photo! Glad I was able to know him through words and discussions of classic film. Time well spent! I am so sad to read this. I know you Lynn will have a heavy heart today. Like so many others here, you were my first friends on the boards. I will never forget the wonderful friendship extended to my son Jamie and me that late night supper at Canter's. Another example how time is not an endless commodity, but it is finite for us all. I had always intended to see you all again, catch a movie somewhere in L.A. and just talk afterwards. Don't keep putting off tomorrow, I tell myself. then I just go to work and drudge through another day. I will remember Kyle's sweetness and his patience and hearing my secrets. Bless him, he kept them. Rest in peace, dear friend. Everyone loses someone in their life that they cherish. For a few select folks who have had the pleasure of writing on these message boards, our friend Kyle was truly one of a kind. And he will be sorely missed. Many have spoken very kindly about his thoughtfulness towards them or that he would always welcome new posters here with a zeal unmatched by any other person. I never had the pleasure of meeting Kyle. I wished I had. But luckily for me he and I would offer up very thoughtful and pleasant commentaries toward each other and we often exchanged private messages. If I ever had any questions regarding anything related to TCM that I could not find a suitable answer to, Kyle would almost always have an answer for me. His replies to me were very courteous and knowledgeble. Our TCM online friendship was based on a mutual respect for one another. I always would comment to him how much I admired his abilities with the TCM Challenge or the way he was always able to find some obscure poster or photo of a bygone Hollywood era. He would often say that he could never compile a list of favorite films nor would want to try to do so, but could not understand how I and several others here on the boards could, like Scott and April. When the 15th Anniversary became a reality and Kyle and several others here who I have had the pleasure of communicating with were set to appear on television with "our" hero Robert Osborne, I thought that I had finally gotten a chance to meet these friends of mine. Watching Kyle speak with Robert, I became acutely aware of just how important films were to Kyle. As Peter has stated he was happy to see the two of them hit it off so well. Writing back and forth with Kyle all of these years, this would not have surprised me. Once he and I ran into a little disagreement. But soon afterwards he PM'd me and told me that whatever it was that was bothering us we should let go. I agreed. I did not often communicate with him especially in recent months but he was nice enough to reply with a PM to me on June 22. I could always count on a reply from him. My heartfelt condolences go out to his family and his close friends, Lynn and Peter. We have all lost a good and truly remarkable friend and who we will never be able to talk with again. Hopefully up in heaven he is right at this very moment sitting down at Musso and Franks and getting the chance to speak with his movie idols and telling him just how much fun he has had watching them all of these years. I am terribly saddened to hear of Kyle's passing. The internet is often cluttered with anonymous people whom we meet through the printed word. Some are great detractors to our collective psyches. Some, on the other hand, add immeasurably to our lives with their knowledge and wit. This was Kyle. There's no doubt hiis death is a tremendous loss to the TCM Boards and Festival goers. It's probably too much to ask TCM to acknowledge him on air but how marvelous would it be to have TCM repeat his segments during an evening screening of MEET JOHN DOE? Thank you Kyle for sharing with us. You will surely be missed. May I ask whether this terrible tragedy was sudden and unexpected? Yes, Kyle was a great resource and I learned a lot from him about studio era movies.